This is the first part of a report made by Clara Ramírez Barat and Olesya Skrypnyk on their study visit to Croatia. It is the eighth article in a series of blogposts and reports on all study visits made for the project “Dealing with the Past in History Education”. In this project civil society actors from different backgrounds, visit schools and institutions in countries that are struggling with a difficult past. The previous article in this series of Ineke Veldhuis-Meesters’ visit to Calcutta, India, can be found here. As members of EUROCLIO’s Dealing with the Past Project (DwP) team, Olesya Skrypnyk (Nova Doba, Ukraine) and Clara Ramírez Barat (AIPR, Brazil office) travelled to Croatia from January 30th to February 1st 2017. In three days, one in Zagreb and two in Split, they met with several civil society actors, state institutions representatives, teachers, and students to learn about how the difficult past is taught in schools, and to discuss the practical challenges involved in dealing with conflicting memories and emotional histories in the classroom. This report briefly summarizes the discussions they held during those days and outlines the main findings of the study visit. On the morning of January 30th, the DwP team had a combined meeting with Documenta and Youth Initiative for Human Rights, two NGOs that work with different aspects of dealing with the past in the country, especially in regards to the adoption of transitional justice measures and the promotion of non recurrence. 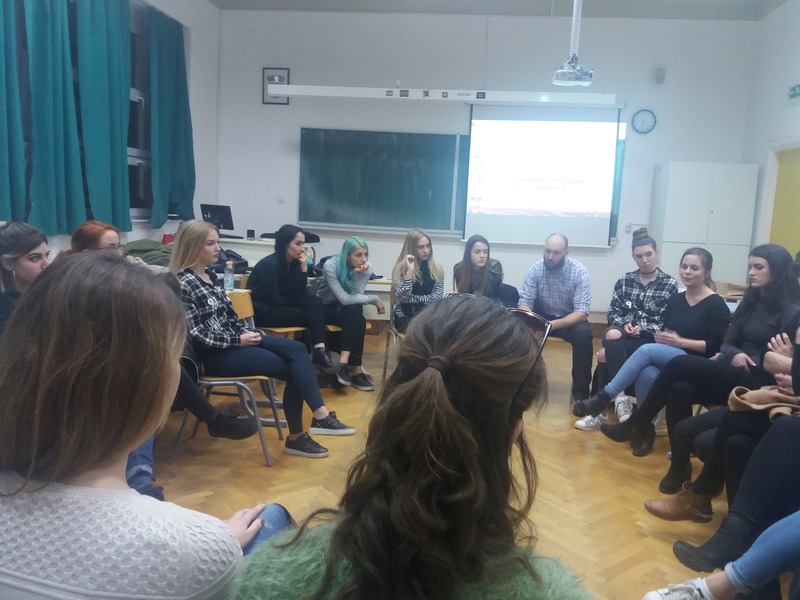 After a brief introduction to the work of both organizations, the discussion centered on the question of how, in their views, history education could help better deal with the difficult past in Croatia. As organizations trying to advance human rights issues in Croatia in relation to the war, however, they found it was very challenging to pursue their mission in the country today and that most of their perspectives were not widely shared by the society. For both organizations, when it comes to education about the recent history, it is important to begin by recognizing that having a certain narrative about what happened is unavoidable. Facts just don’t stand alone. In this respect, for them, one of the biggest challenges today is that Croatia is still a young nation, and hence identity and tradition play a key role in the ongoing state building project. According to them, in broad terms, history education is not being taught today primarily with the intention of dealing with the past, but rather to teach young people the narrative of how Croatia became an independent nation. When it comes to better understanding the War of Independence, its causes, how it unfolded, and its consequences, both organizations considered that the topic is not adequately covered in the school curricula. History classes normally end with the story of World War II, and only when a teacher is especially interested, students will learn more about Yugoslavia and the Independence War. They also noted the scarcity of pedagogical material to help teachers and students to critically learn about these topics. Learning from real sources and being exposed to different perspectives is rare, and besides the mandatory visit to Vukovar, there are almost no extra-curricular activities (like visits to memorials or museums) to complement what is taught in the classroom. The second meeting was held at the Memorial–Documentation Center for the Homeland War (CDMCHW), a state scientific institution and specialized archive run by the Ministry of Culture. Its mission is to preserve, document, and research the history of the Croatian War of Independence (1991-1995). As part of its mission, the Center organizes exhibitions and public lectures and actively cooperates with educational institutions (both public and private) throughout the country to help them better understand and convey the recent Croatian national history, especially the War of Independence and its consequences. With the support of the National Agency of Education, for example, they organize an annual seminar for teachers about the Homeland War. The seminar, which is done in a voluntary basis, gathers more than 100 teachers from all over Croatia every year. For the staff at the CDMCHW, the war is a subject well covered by the current Croatian history curricula. As an archive, which collects and preserves a myriad of documents of the war, when it comes to history, “the facts” are more important than understanding the narratives built. While they recognize experiences are different, as historians, they think their capacity to interpret those experiences is limited—the goal is rather to have to all the facts from both sides of the war and write about the events only based on these facts. Still, they recognize that there are divisions in Croatia today on how the recent history is interpreted, which go back to the time of World War II and the Communist time. The first meeting on this day was held at the University of Split. The DwP team visited the History Department and had a discussion with a group of professors and students (members of History Students’ association). Encouraging students to engage in extra-curricular activities (e.g. work with additional sources). After presentation, the students and the professors joined a discussion on the topic of the challenges of a difficult past in history education in Croatia, whether there are enough materials on the recent history in the school curricula, and how the History department members deal with the challenges of emotional histories. The students also mentioned that they wanted to be given real facts while studying difficult history. They also felt they should learn more about the Croats crimes and what they “did wrong.” In their view, the topic of the Croatian War of Independence is not sufficiently represented in school textbooks. Regarding their school years, they admitted that students very often got information about the war events from their families or mass media, which were not objective. One of the professors considered that today there was a wide consensus about how to perceive the Homeland War in Croatia, but recognized that there is still a problem with the interpretation of WWII that splits the nation. This blogpost concludes the first part of the report of this study visit to Croatia. This study visit has been a part of the project “Dealing with the Past in History Education”, supported by the Robert Bosch Stiftung. For more information on this project, please visit the project page.